Blackwell Gallery is located in the beautiful town of Coeur d'Alene, Idaho. Just steps from the waterfront, and right in the heart of the retail and dining district, our prime location offers a fabulous place to home our masterpieces. 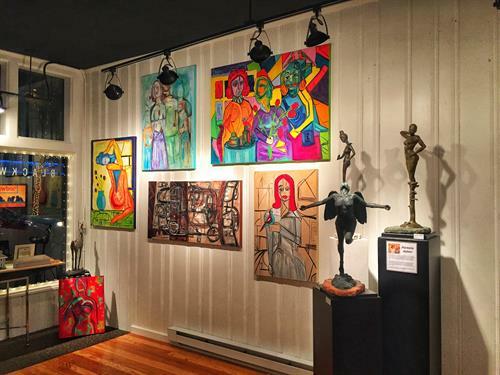 Blackwell features anywhere from 10-20 local artists with various mediums in contemporary and modern paintings, sculpture, metal, mixed medial and woodwork. Our artists visit the gallery on a regular basis, spending time with customers and visitors to engage in their passion that they have for art and the different stories behind their pieces. Our mix of modern, contemporary, and abstract art makes us a very unique and exciting gallery to shop. You won't find another like us. Come visit us...we are sure you'll want to take an original piece home to add to your collection. We participate in the Arts & Cultural Alliance's Art Walk events the second Friday of every month from 5:00 to 8:00 pm. We will either be introducing a new local artist or having a specialty themed exhibit (i.e. Black & White Show, Small Works Show, Visiting Artist Show, The ''Art'' of Photography Show). All shows feature an opportunity to meet and interact with our local artists as well as complimentary beverages. In addition, our unique space (by location and design) is available to non-profits free of charge for evening and off hour events. For more information contact Beth Rich Brown, Gallery Manager/Curator at 208-699-2116 for more information. Northeast corner of Sherman Avenue and 2nd Avenue in the heart of downtown Coeur d'Alene ... right next Door to Hudson's Hamburgers.